I left medicine in 2010 to pursue other dreams and this blog is a collection of stories and photographs associated with that journey. The journey includes hiking 1800 miles along the Appalachian Trail, touring America by bicycle, crisscrossing the US in an old Honda CRV and settling down for a few weeks to months in places that became hard to leave or were on that list of “places I want to live someday”. In 2013 I spent six months backpacking around Europe, walked across northern Spain on the Camino and sailed from England to Puerto Rico. All my travels have been fueled by curiosity not bravado and none were record breakers or “extreme adventures”, but all were fulfilling beyond expectations. The stats tell me my most popular post is Camino-What To Pack but my personal favorites are A War Story and Generations of Inspiration, The Beach and Good Body Self Image and Tourist, Traveler, “enough”. The “Appalachian Trail Journal” located in the column on the right is a collection of thoughts, adventures, misadventures and photographs associated with my eight months on the AT. Thanks for stopping by and I hope you find my writings and photographs entertaining and worth following but if not, no worries. The web is huge, in time you’ll find what you’re looking for. © Thomas N. Chapin and brickthomasblog.wordpress.com , 2012 through present. Unauthorized use and/or duplication of this material without express and written permission from this site’s author and/or owner is strictly prohibited. Excerpts and links may be used, provided that full and clear credit is given to Thomas N. Chapin and brickthomasblog.wordpress.com with appropriate and specific direction to the original content. You have a great blog. I shall be keeping an eye on it. Love your blog, your aspirations, your implementation. Cool! Lots of inspiration here. Thanks for stopping by, too. Thanks for liking my post. Your blog looks like it captures a great time for you. Enjoy retirement. I look forward to reading more of your work. Happy and safe travels. See I told you are not too shabby yourself ! as I mention.. I hope to have half the experience like you I would be happy ! keep living the life. Thanks. Stay healthy and keep living big. This is very inspirational to read . You have shown me that it’s okay to consider leaving medicine and take on a new adventure in life. I am so glad that you have stopped by and said hello on my blog. Have you found a way to sustain this new lifestyle or are you still working out a plan ? Thanks for following and sharing your world trip experience. I look forward to following your adventure. Happy travels. Great blog. We are looking for people to guest post on our new retirement site retirementandgoodliving.com If you are interested drop us a line via the contact page. I’m writing you from Stillwater, MN where I’m visiting with my dad (buzz) & sister Lisa. We have seen Lots of childhood pics of you too! It’s great to hear you are all together in Stillwater. Thank you so much for the invitation and passing along my blog site. It’s been too long since our last get together and I can’t think of a better site than Yosemite. Sue would love to meet you as well so when we get in your area I promise you will hear from us. Have fun in Stillwater. Thanks! I find your blog and subject very interesting too. It’s another place I need to travel to. Hey there, Brick, how are you? Just hopping around the blogosphere as I digest my Thanksgiving dinner and found you. If you like, come visit me at http://www.thatssojacob.wordpress.com and hang out for awhile, especially if you see something you like. Have a good one! Thanks for stopping by and leaving a comment. I will check your blog out and see what you’re writing about. Just enjoying reading your blog with my late night mug of tea, it’s so interesting I’ll definitely be returning to read more! Thanks for visiting. You are always welcome. ‘Ivy was here’. I’m glad you’re still part of wordpress communitie if you’ve stopped traveling. I only ever had the means to get to Las Vegas from Minnesota, but what ah adventure! You’re a great writer, as if I was there. Hi Ivy and thanks for being so kind. I think adventure is more about attitude than miles. Moving from Minnesota to Las Vegas sounds like an adventure to me. Thank you for your visit to my site, and for all the ‘likes’ … I truly appreciate them. The reason you are seeing so many posts coming through is that I am amalgamating two blogs to keep my future costs down, so apologies if you’re feeling ‘swamped’. I am truly humbled by your site, and that is not a glib, throw-away remark. The things you have done and seen, your beautiful writing and your expertise in collating everything together just leaves me (nearly) speechless. I have just skimmed the surface this morning, but I’ll be back at various times to dip in to your stories. You have such a great blog, and this section is specially inspiring! You’re basically fulfilling today what Verne and I imagine our future years may be. Thank you so much for sharing! Thanks! Happy travels and I look forward to hearing more of your adventures. Chrome Paramount! And to think I thought I had the only one. It’s voyages are done & final resting place is on the library wall at Adventure Cycling Assoc in Missoula. Thanks for dropping in on your travels and the likes look forward to reading your Appalachian Trail Journal, at present it tells me the feed is down. Chris. My pleasure, CJ. 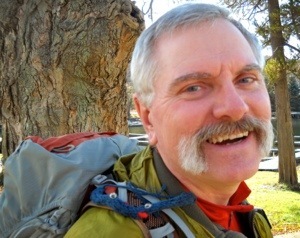 The trail journal link is down and I haven’t been able to reconnect it but if you’re interested my AT journal is at http://www.trailjournals.com/journal/11900. Or you can search by my trail name which was Snake Hips. 🙂 Thanks for commenting. Thank you for that information Thomas I look forward to exploring. Chris. So glad I found your blog! Here’s hoping my first Camino will kick off a lifetime of adventures like yours. Thanks, Molly. I suspect your Camino will be only one of many adventures in your life and I hope they all bring you peace, happiness and personal growth. Bon Camino.